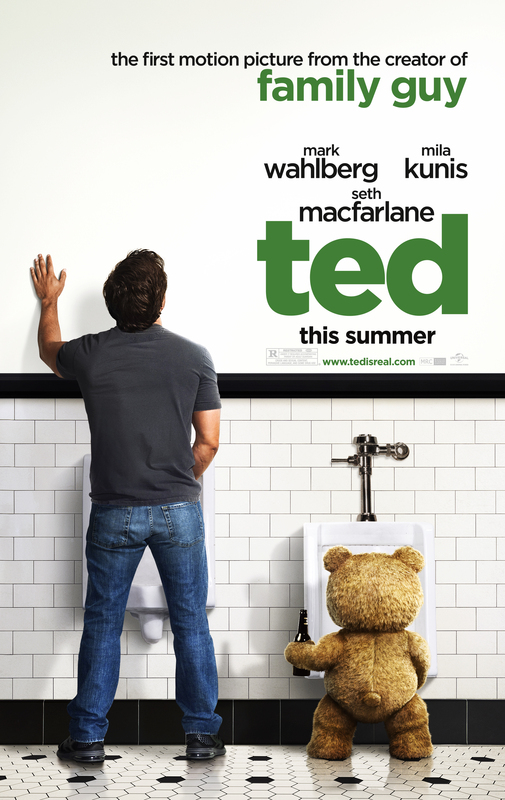 Ted was a film about a short, annoying, stoic inanimate object that can’t act. There’s also a talking teddy bear. You may know that The Movie Mind has been harsh on the comedic turns that Wahlberg has taken over his career, but in fairness, I was trying to save you all from THIS. He showed us clear as day that he was not even capable of playing a supporting comedic role next to Will Ferrell, one of the funniest comedy actors around, in The Other Guys. Why would anyone think he’s capable of carrying a film starring opposite a talking bear? The Movie Mind took a lot of flack for bashing The Artist, with some readers saying that I had no choice but to hate that film because it goes against everything my “persona” stands for. Well that wasn’t true…I just thought it sucked (relatively speaking). Maybe this review is a way to balance out the karma from the feedback on that review because all signs should point to me loving Ted. While I love the “dumb” comedies more than the next guy, I’d have to have an all-time low of brain cells to think that this is anything more than a one-trick pony, and not even a good one at that. This film was an hour and forty-five minute episode of what Family Guy would be if it was on HBO. The fact that Seth MacFarlane didn’t even change the voice of the bear in the slightest just goes to illustrate his laziness. He’s made a career on ripping off The Simpsons and South Park, so why not just stuff Peter Griffin into a teddy bear and see what kind of movie you can get out of it? The gist of the story is Walhberg’s character (John Bennett) has no friends as a little boy and after getting a teddy bear for Christmas, he wishes it came to life. Well his wish is granted and thanks to a shooting star we all had to deal with an hour and half more of a teddy bear drinking, doing drugs, and cursing. Now by no means am I saying I’m above that sort of humor, and I even managed to drop a couple of giggles at some scenes. But after about fifteen minutes of it the gig is up. The novelty of a crude talking bear kind of wears thin. So what does MacFarlane do about it? He ratchets up the lewd/crude even further, taking it to a level that I’d have a hard time believing would make it onscreen if it was a human actor playing the part. At a certain point it just becomes kind of creepy watching a freakin teddy bear do some of the things it does. The problem is that’s the whole premise of the entire film. It’s a one note running joke and there’s nothing more to it. They even make a couple veiled attempts at creating a heartwarming storyline which is ends up being even funnier than the jokes themselves. I think Family Guy is funny, but I prefer the hinting at the jokes and suggestive situations as opposed to seeing a furry toy actually engaging in them. Walhberg makes matters worse because in my mind he has thoroughly proven that he can NOT be a comedic actor. Unless he’s playing an a-hole wannabe tough guy from Boston, let’s keep him off the screen (FYI – I’ll give you a nickle if you can guess as to where this film is set). Interesting Cameo Appearance: Tom Skerritt (aka Sheriff Jimmy Brock from 90’s classic TV series, Picket Fences) as himself, in a very odd and random appearance that made as much sense as the point of this film. Ted: Thunder buddies for life, right, Johnny? Ted: Oh, where are my manners? Lori, this is Angelique, Heavenly, Charene, and Sauvignon Blanc. I love you girls. Y’know, somewhere out there are four terrible fathers I wish I could thank for this great night!